Across 5 Stages including Sankeys Outdoor Arena, Sankeys Indoor Arena, Unusual Suspects, Redlight and Dance 88/89! It's been 25 years of music, 25 years of love, 25 years on the dance-floor together and 25 years in each other's hearts. Born in Manchester, Sankeys has grown and spread across the planet but its the soul of our beloved city which we have carried with us everywhere since. 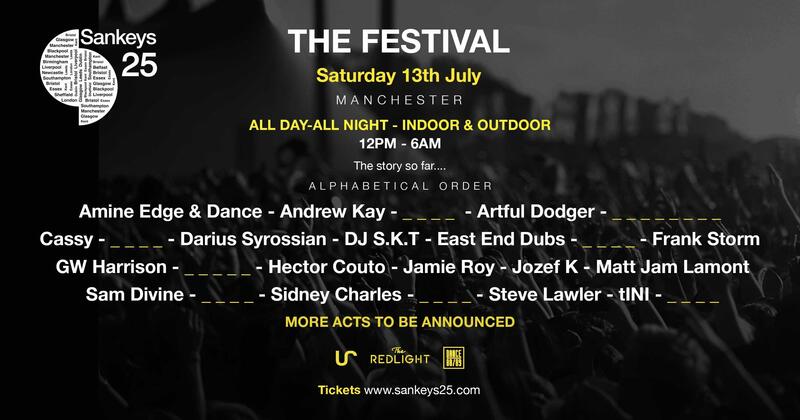 Sankeys at long last has its very own festival... indoors, outdoors, all day and all night with some of the world's biggest artists and the most ambitious show we have ever dreamt up. We will be taking over a brand new location for Sankeys which is the perfect setting for our largest ever event! Manchester and the World. Get ready for the party of a life time in Summer 2019!